A fatty liver, also known as steatosis, may be treated and prevented with a fatty liver diet. Of the two types of fatty liver disease, alcoholic fatty liver disease and nonalcoholic fatty liver disease, this article will focus on the best diet plan for nonalcoholic fatty liver disease, or NAFLD. What is a fatty liver? Basically, this occurs when the normal levels of fat within the liver exceed more than 10 percent of the organ’s weight. The accumulation of fat cells in the liver usually does not cause damage, unless these cells become inflamed and the condition steatohepatitis develops. NAFLD may be caused by genetics, diabetes, medications, and issues within the endocrine system. Nutritional problems such as obesity, protein malnutrition, starvation, and the surgical procedure intestinal bypass may also be responsible for the excess fat cells. Fatty liver is seen in more than 80 percent of obese people, and may affect male and females of all ages and of all ethnic backgrounds. Presently, more than 25 percent of all Americans have nonalcoholic fatty liver disease. What Is the Role of Diet and Nutrition on the Liver? Can We Reverse Fatty Liver with Diet and Other Changes? The liver is responsible for hundreds of functions, including processing and filtering toxins from everything we eat, drink, and breathe. This also includes anything we use on the skin’s surface, such as lotions. A proper diet with essential nutrients can help the liver function properly, and continue to fight infections, regulate hormones, stimulate blood-clotting abilities, and provide energy, just to name a few. This starts with following a healthy diet and lifestyle by eating breakfast daily, managing portion control and calories, eating lots of fruits and vegetables, limit saturated fats while focusing on unsaturated fats, and keeping a food journal. As mentioned, managing a fatty liver starts with a well-balanced, healthy diet. Protein is essential and can be found in poultry, lean red meats, seafood, eggs, legumes, nuts, seeds, and sugar-free protein powder. The popular Mediterranean diet encourages the reduction of liver fat by supplying complex carbohydrates, antioxidants, and healthy fats. The food choices common in this regimen may qualify as a fatty liver treatment diet. Studies have suggested that patients with fatty liver disease may lower the risk of liver damage by drinking coffee. This may be due to caffeine being responsible for lowering any existing abnormal liver enzymes. A study recently published in the European Journal of Gastroenterology and Hepatology revealed there was a reduced risk of non-alcoholic fatty liver disease in regular coffee drinkers. This report recommends further studies to support the link between caffeine and fatty liver disease prevention. Raw and cooked vegetables, especially greens, may help with weight loss and maintaining a healthy weight. For raw vegetables, consume unlimited amounts of spinach, kale, Brussels sprouts, celery, zucchini, cucumber, and carrots. A glass of raw vegetable juice may be substituted for one serving of vegetables as raw juice contains high amounts of antioxidants, vitamins, and minerals. Cooked vegetables can also be enjoyed as a filling starch, with the exception of potatoes. Broccoli may be one of the better foods for fatty liver as it prevented fat buildup in the livers of mice, according to a study published in the Journal of Nutrition. While some fruits are high in healthy fats, many contain high amounts of sugar and should be limited to two a day, especially with a weight loss plan. Fruit can be added to a protein smoothie or consumed with plain yogurt or a handful of nuts. Avocado is one of the healthier fruits with its high content of fiber and healthy fats. A Japanese study of rats suggests that avocados may slow damage to the liver, as reported by the American Chemical Society. The antioxidants of the fruit aronia, also known as chokeberries, may also protect the liver and help to reduce weight. Tofu is high in protein and low in fat. Made by coagulating soy milk, tofu helps to reduce buildup of fat in the body, as well as the liver. The American Society for Biochemistry and Molecular Biology published a study by the University of Illinois, showing that liver fat was reduced in rats fed soy protein. This same protein is found in tofu. Fish that are high in omega-3 fatty acids may reduce levels of fat in the liver and reduce inflammation. Consume tuna, trout, salmon, and sardines for the highest amount of healthy fatty acids. Add oatmeal to your diet for fatty liver, as the oat grains contain carbohydrates and soluble fiber that gives the body energy. This energy can be used to reduce weight and fat tissue. Oatmeal also gives a feeling of satiety to prevent overeating. Raw nuts and seeds, such as cashews, pistachios, and pumpkin seeds, contain selenium, which can help detoxify the liver. Selenium is also a strong antioxidant. High amounts of omega-3 fatty acids may promote proper liver function and work to lower bad cholesterol levels. Walnuts are a great source of these healthy fatty acids. Sunflower seeds help the liver with the powerful antioxidant of vitamin E.
Milk and dairy products offer high levels of whey protein, which has been shown to protect the liver in recent studies. In 2011, a study published in the Lipids of Health and Disease journal illustrated the positive effects of using whey protein on fatty liver of rats. When cooking, use olive oil instead of butter, margarine, or shortening as it has high levels of omega-3 fatty acids to reduce liver fat. As olive oil lowers liver enzyme levels, it could also help with weight loss and is easily used as part of any fatty liver disease diet. Garlic may stimulate liver detoxification with its selenium and arginine contents, which also may lower the blood pressure within the liver. Its sulfur components of alliin and ajoene, along with allicin help to promote proper functioning of the liver. This herb works as an antibiotic, antifungal, and antioxidant. Green tea has been used to prevent heart disease and lower fat cells and cholesterol. A green tea study by a nutritional scientist and professor of Nutritional Sciences at the College of Agriculture and Natural Resources showed promising effects on treating fatty liver disease. His research shows an improvement in liver function by using green tea to block fat storage in the liver of rats. With a fatty liver, it is important to understand the foods that may stimulate a rise in blood sugar levels and weight gain. We have listed below what foods to avoid with a fatty liver. High Sugar Content – With high blood sugar levels causing an increase of fat in the liver, avoid cookies, candy, fruit juice, soda, and chocolate with hydrogenated vegetable oil. Fried Foods – Any food cooked in high fats and containing large amounts of calories such as French fries and deep-fried vegetables should be avoided. This also includes snacks like potato chips, crackers, pretzels, and tortilla chips. White Flour – Avoid foods produced with white flour such as white bread, rice, and pasta as they are processed. This may cause blood sugar levels to rise due to lack of fiber content as opposed to whole wheat flour. Pastries – In addition to the use of white flour, many biscuits, donuts, muffins, and bagels contain hydrogenated vegetables oils and possibly sugar. Salt – Eating high sodium content foods and adding salt to meals can raise sodium levels in the body that may cause excess water to be retained. Limit intake to 1,500 milligrams (mg) daily. Red Meat – Avoid consuming red meat and processed meat that contain high levels of saturated fat. Diet Foods – Avoid foods with labels of “diet” or “slimming,” as they may contain high fat, high sugar, or artificial sweeteners. These may be listed as diet sodas, diet jam, diet ice-cream, and diet yogurt. Tip: Add chopped apples, berries, dried raisins, flaxseed, sunflower seeds, walnuts, or almonds to cereals. Tip: Use flavorful soup stock instead of water for cooking of rice and use one to two teaspoons of toasted almond silvers on vegetables. As there is no medical treatment for fatty liver or any surgical procedures to help, home remedies are usually recommended to deal with the effects. So, how long does it take to reverse fatty liver disease? Depending on your level of commitment to preventing the disease, the expected amount of time will vary. Living with a fatty liver can have its challenges, but there are lifestyle changes and other useful tips for how to reduce fatty liver naturally. Follow a safe weight loss regimen that allows one to two pounds per week. Keep any diabetes condition under control by regulating blood sugar levels. Consume three meals a day and two snacks to prevent malnutrition. Lower triglycerides with diet or medication. Limit or avoid alcohol use to prevent fatty liver. Monitor the health of the liver by having regular check-ups with your doctor. A nonalcoholic fatty liver diagnosis can be a sign that your nutrition intake requires immediate attention. Thankfully, this is a condition that can be managed by eating foods that dissolve the excess fat cells accumulated in the liver. Too many of these fatty cells can cause the liver to malfunction, and fail to filter toxins from the body. This can lead to severe complications, especially if these cells become inflamed. Remember to add foods abundant with vitamins and minerals to your daily diet and refrain from munching on fried food and those foods with high sugar content and any processed with white flour. “Non-Alcoholic Fatty Liver Disease: A Patient’s Guide”, US Department of Veteran Affairs; https://www.hepatitis.va.gov/pdf/non-alcoholic-patient-guide.pdf, last accessed September 5, 2017. “Steatohepatitis and Steatosis (Fatty Liver)”, Patient web site; https://patient.info/in/doctor/steatohepatitis-and-steatosis-fatty-liver, last accessed September 5, 2017. “Liver – fatty liver disease”, Better Health Channel web site; https://www.betterhealth.vic.gov.au/health/conditionsandtreatments/liver-fatty-liver-disease, last accessed September 5, 2017. “Diet And Your Liver”, American Liver Foundation web site; http://tn.gov/assets/entities/health/attachments/ALF_Diet_Liver.pdf, last accessed September 5, 2017. Jamal, Hyder Z., “Non-Alcoholic Fatty Liver Disease: America’s Greatest Health Risk of 2015?” Scientific American, February 9, 2015; https://blogs.scientificamerican.com/guest-blog/non-alcoholic-fatty-liver-disease-america-s-greatest-health-risk-of-2015/, last accessed September 5, 2017. “How To Eat Right With Fatty Liver Disease,” Web MD; http://www.webmd.com/hepatitis/fatty-liver-disease-diet#1, last accessed September 5, 2017. Wijarnpreecha, K., et al., “Coffee consumption and risk of nonalcoholic fatty liver disease: a systematic review and meta-analysis,” European Journal of Gastroenterology & Hepatology, February 2017, 29(2):e8-e12; https://www.ncbi.nlm.nih.gov/pubmed/27824642, (https://doi.org/10.1097/MEG.0000000000000776), last accessed September 5, 2017. Kargulewicz, A., et al., “Dietary recommendations for patients with non-alcoholic fatty liver disease,” Przeglad Gastroenterologiczny, March 1, 2014, 9(1):18-23; https://www.ncbi.nlm.nih.gov/pmc/articles/PMC4027841/, (https://dx.doi.org/10.5114%2Fpg.2014.40845), last accessed September 5, 2017. Cheng, YJ, et al., “Dietary Broccoli Lessens Development of Fatty Liver and Liver Cancer in Mice Given DiethyInitrosamine and Fed A Western or Control Diet,” The Journal of Nutrition, March 2016, 146(3):542-50; https://www.ncbi.nlm.nih.gov/pubmed/26865652, (https://doi.org/10.3945/jn.115.228148), last accessed September 5, 2017. American Chemical Society, “Avocadoes Contain Potent Liver Protectants,” ScienceDaily, December 20, 2000; https://www.sciencedaily.com/releases/2000/12/001219074822.htm, last accessed September 5, 2017. American Society for Biochemistry and Molecular Biology, “Soy protein alleviates symptoms of fatty liver diseases, study suggests,” ScienceDaily, April 22, 2012; https://www.sciencedaily.com/releases/2012/04/120422162417.htm, last accessed September 5, 2017. Chung Yee Ho, J., “Dietary Guidelines for NAFLD (non-alcoholic fatty liver disease),” Liver; http://www.liver.ca/files/PDF/Fatty_Liver_Recipes/Dietary_Guidelines_for_NAFLD_-_English_-_Final.pdf, last accessed September 5, 2017. Hamad, E., et al., “Protective effects of whey proteins against non-alcoholic fatty liver in rats,” Lipids in Health and Disease, April 13, 2011, 10:57; https://www.ncbi.nlm.nih.gov/pmc/articles/PMC3096574/, (https://dx.doi.org/10.1186%2F1476-511X-10-57), last accessed September 5, 2017. Lynn, “Fatty Liver and Garlic: Should You Avoid It or Eat More?” Fatty Liver Diary, February 25, 2017; https://www.fattyliverdiary.com/fatty-liver-and-garlic-should-you-avoid-it-or-eat-more/, last accessed September 5, 2017. Omara-Otunnu, E., “Nutritional Scientist Studies Impact of Green Tea on Liver Disease,” University of Connecticut, February 9, 2009; http://today.uconn.edu/2009/02/nutritional-scientist-studies-impact-of-green-tea-on-liver-disease/, last accessed September 5, 2017. 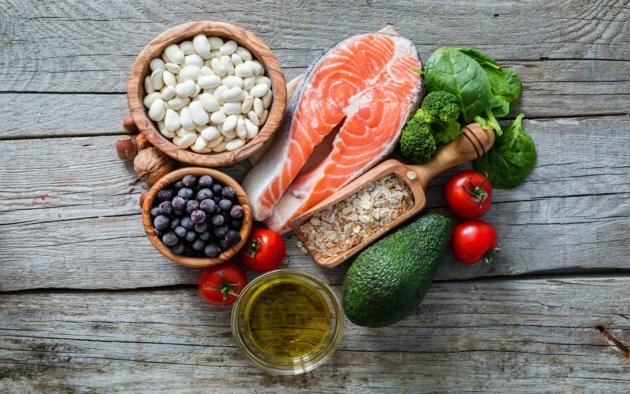 “12 Foods to Help Fatty Liver Reversal,” Healthline; http://www.healthline.com/health/fatty-liver-diet#overview1, last accessed September 5, 2017. “What Should You Be Eating If You Have A Fatty Liver?” Liver Doctor, November 5, 2012; https://www.liverdoctor.com/what-should-you-eat-if-you-have-fatty-liver/, last accessed September 5, 2017. “NAFLD Non-alcoholic fatty liver,” Liver Foundation; http://www.liverfoundation.org/abouttheliver/info/nafld/, last accessed September 5, 2017.